Hytale, an RPG from the designers of one of Minecraft’s most popular servers, looks a lot like its blocky inspiration, but there are some big differences under the hood. A recent blog update digs into one of the upcoming sandbox’s most important features: its world generation. 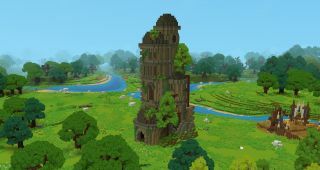 Like Minecraft, Hytale’s procedurally generated worlds are a mixture of typical sandbox biomes—forests, snow, lava—punctuated by dungeons and prefabricated buildings. And, of course, there’s a whole other world below your feet, full of labyrinthine caves with the possibility of treasure. There are some rules to the way these worlds are laid out, however. Each world is split into zones, four so far, with appropriate challenges that you’ll encounter as you progress through the story in Hytale’s adventure mode. So you’ll start in the forest, then progress into the desert and so on. Zones have their own set of thematically linked biomes, so you’ll find different kinds of forests and verdant hilly regions in the first zone, and even their underground areas are distinct. The first looks most like its progenitor’s caves, but when you hit the fourth zone, where the surface is full of volcanoes and lava, you’ll discover underground forests and lakes. Underground dungeons are procedurally generated, but they use rules that conjure up chambers connected by tunnels that usually lead to a final room with its own challenges and special rewards. Even though they’re random, they’re still full of prefabricated bits and pieces, and you should still feel like you’re exploring a proper dungeon. So far, Hypixel has designed almost 4,000 prefabs, from ruined towers to special encounters, but they’re peppered throughout the world randomly. As well as being unique objects, they can also have triggers an events assigned to them. Coasts have their own biomes, too. The land doesn’t just stop when it reaches the sea; it transforms into beaches or craggy shorelines that also draw from the zones other biomes. These distinct elements continue if you decide to take a dip in the ocean. Underwater areas have unique biomes and even submerged ruins, also connected to the zones they’re in. Eventually you’ll reach the ocean shelf, with the deep ocean, a zone itself, ahead. NPCs, factions, buildings, even loot is determined by the zone and the world generation rules, so while you might not know what’s over the next hill, it should at least make sense within the context of the area you’re exploring. Sometimes, says Hypixel, the rules collide and create “happy little accidents”, such as ravines that cut a dungeon in half. How the world generates is still up to players, however. All the rules that govern world creation can be tweaked or even replaced with entirely new rules, and new prefabs can be designed, as well. Everything can be changed or added to, all directly from the game itself. You can dig through a script and edit it while you’re playing. It sounds a bit more structured than Minecraft, though it’s still a procedurally generated sandbox. The adventure mode, where there’s an RPG story guiding you forward, is just one of several modes, however, and it will be possible to just conjure up something for your creative projects or spend all your time playing or designing the kinds of minigames that made the Hypixel Network so popular. Hytale doesn’t have a release date yet, but expect more updates soon.